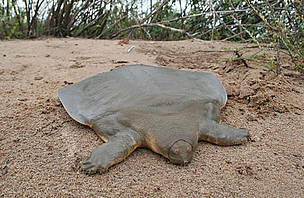 Cantor’s giant softshell turtle is easily recognized by its broad head with eyes close to the tip of the snout giving it a frog-like appearance (hence the Khmer-name “Frog Head Turtle”). Cambodia is believed to hold a number of significant populations of this species in river swamps, estuaries, and mudflats in lowland areas. 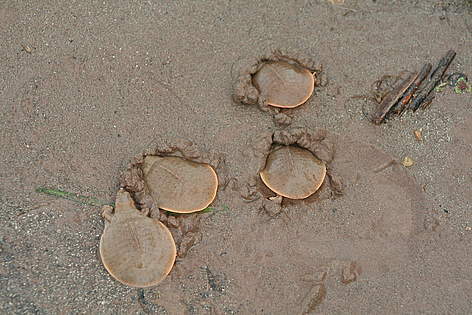 A recent WWF-led survey even confirmed breeding giant softshell turtles along the Mekong mainstream. As with most turtles, this species is under threat because it is easily collected and sold to local and international traders or consumed by hunters. Adult Cantor's giant softshell turtle along the Mekong central section in northern Cambodia.